My angular js Web application is working fine in dev environ ment as expected once its deployed to higher environment . While running/browsing the application in IE Edge the application by default selecting the 8 and my application is not working since ie 8 wont support angular js. I tried in all possible ways but while browsing the application by default it is selecting the ie mode 8 and application not working. My hosted environment has compatiable view settings by default so am trying to override default setting by above trials but no luck. Any suggestions or any issue with Edge or my code ? 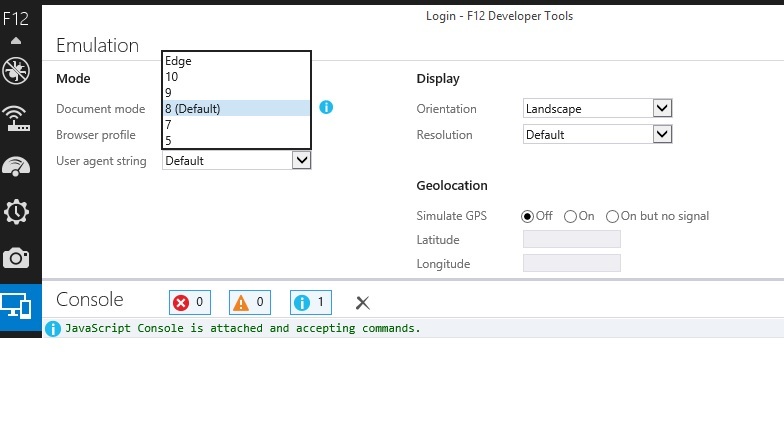 Issue But my application opening in ie8 by default in higher environment ? Can you provide us with the fiddler trace along with the project that you are seeing this problem with in Edge please? Sorry about the delay in getting back to you on this item of feedback. passwords or financial data while collecting the trace. Download and install Fiddler on your machine. file and please compress and upload the file to this connect.